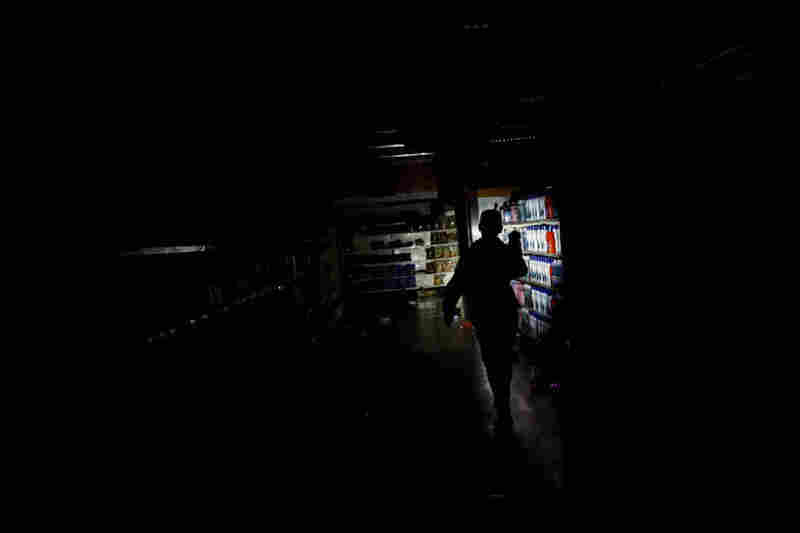 Venezuela's Power Outage Continues, Situation Grows Desperate The country has been hobbled by a blackout since Thursday. People wait in long lines for gas and water and increasingly are having difficulty communicating by phone or Internet. 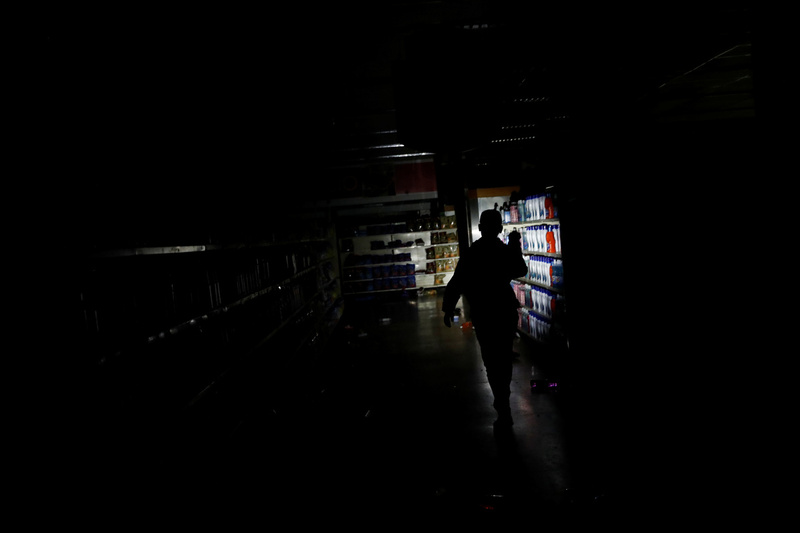 A worker inspects damage in a supermarket in Caracas on Sunday after it was looted during Venezuela's dayslong blackout. Venezuela has been in the grip of a crippling blackout for four days — and the humanitarian situation there is growing increasingly dire. Signs of the crisis are everywhere you look in the Venezuelan capital. "Drive around Caracas, and you see long lines of cars waiting for hours at the few gas stations still operational," NPR's Philip Reeves reported from the city. "Motorists park on highways, cell phones aloft, searching for a signal. The rich have taken refuge in luxury hotels. The poor stand in lines in the street," Reeves added. 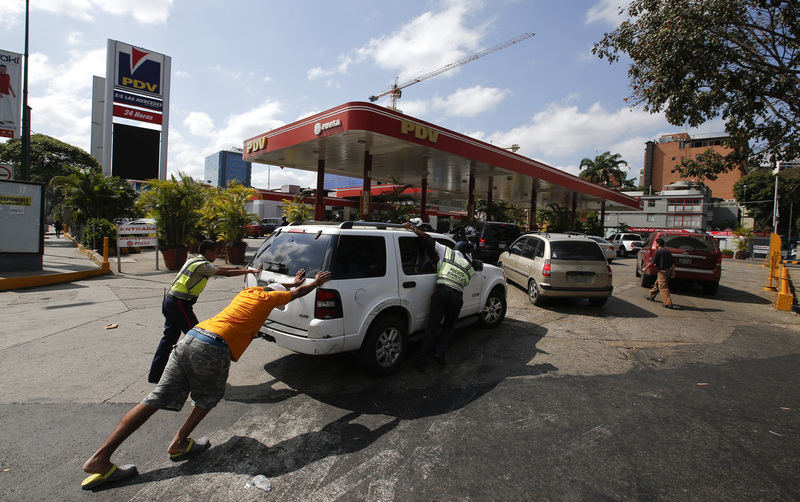 Amid the power outage, people in Caracas push a car without fuel to one of the few gas stations that has its own electric generator. The power outage has affected water pumps in some Caracas neighborhoods, meaning that people are waiting to fill water bottles at public locations such as springs. Schools and public offices remained closed on Monday, according to Reeves. The precarious humanitarian situation is worsening as the country remains in a political stalemate. The crisis pits embattled President Nicolás Maduro against opposition leader Juan Guaidó, who took the oath of office at a rally in January and is backed by the U.S. and dozens of other countries that recognize him as Venezuela's rightful leader. A man collects water in El Ávila National Park during Venezuela's blackout, which has affected the water pumps in people's homes and apartment buildings. Much of the country was plunged into darkness Thursday, reportedly after major problems coming from the country's primary hydroelectric power plant, Reeves said. It's not clear whether the issue is with the plant itself or the transmission lines leading from it, according to Reuters. Maduro's government has said the outage is the result of sabotage by the U.S., though it hasn't provided evidence to back that claim. "While the promoters of hate, death and violence delight in their destabilization plans, President Nicolás Maduro has ordered a deployment of ministers to ensure the Venezuelan people are attended to," Information Minister Jorge Rodríguez said in a televised address, as Reuters reported. Meanwhile, the opposition has said the blackout is the result of years of incompetence that has caused the power grid to deteriorate. 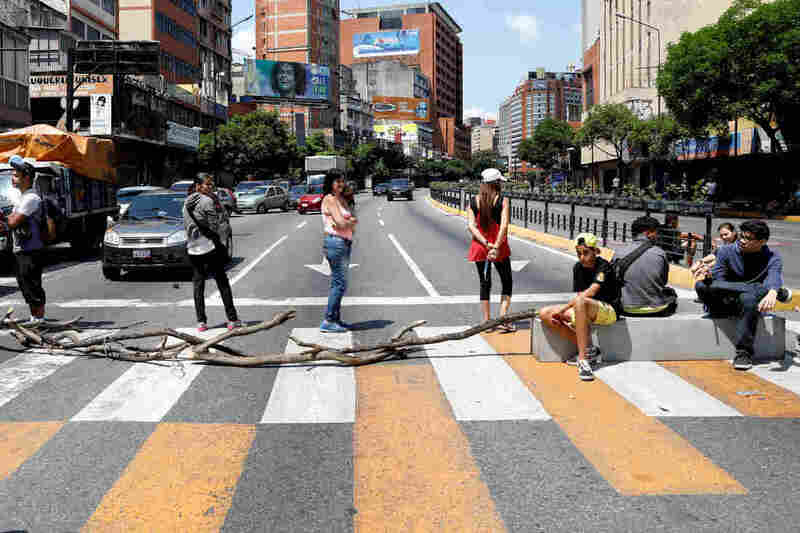 People block a street in Caracas on Sunday to show their anger about the power outage. "The regime at this hour, days after a blackout without precedent, has no diagnosis," Guaidó told reporters on Sunday, as Reuters reported. Residents in some areas have seen sporadic restoration of power — while people in other places are growing more desperate and angry. It's a harrowing situation for anyone counting on electricity for health needs. A mother waits with her child in the emergency room of Caracas' University Hospital during a continued power outage on Sunday. Venezuelans are now in the fourth day of a major blackout with no independent explanation for the power outage, though many Venezuelans suspect it's simply part of the country's long deterioration. 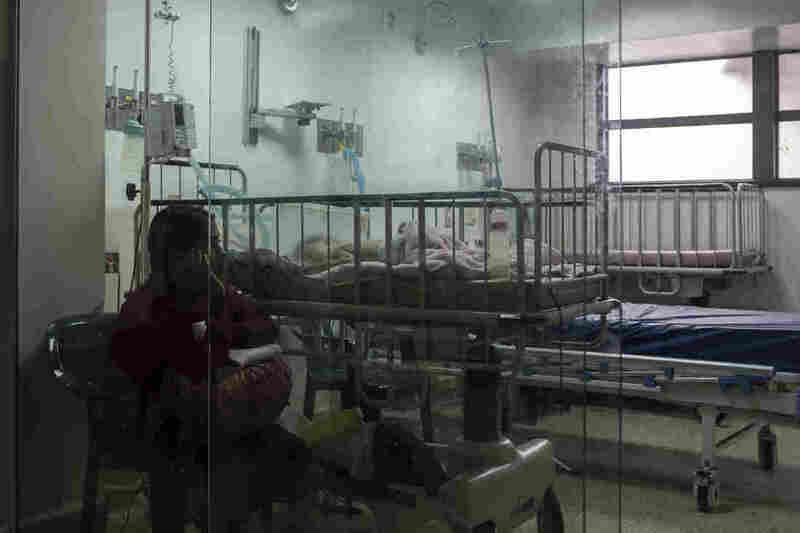 According to The Wall Street Journal, the independent health watchdog Codevida said that "15 dialysis patients have died as a result of the blackout and some 10,000 more were at risk if they continue without treatment." Venezuela is struggling with hyperinflation, and many people had trouble obtaining basic necessities even before the latest political crisis. Now there are reports of looted supermarkets in Caracas. Images taken by a photographer for Reuters show a worker using a flashlight to inspect a supermarket that was hit in the capital. 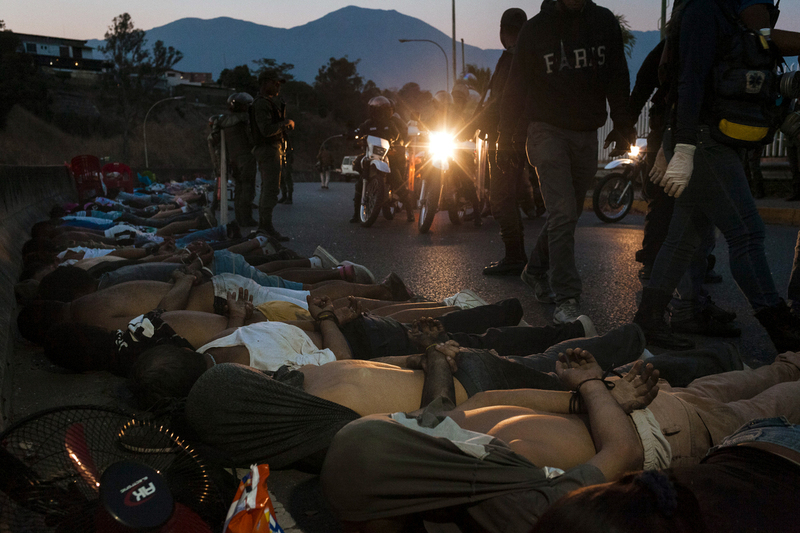 Another photo, from Bloomberg, shows a long row of people lying facedown in the street after they were detained for alleged looting in the Santa Cruz del Este neighborhood of Caracas. Their hands are bound behind them, and their shirts are pulled over their heads to cover their faces as security officials stand over them. People lie on the ground after being detained for allegedly looting a supermarket on Sunday. "The food we had in our refrigerators has spoiled. Businesses are closed. There's no communication, not even by cell phone," 49-year-old Ana Cerrato told Reuters. "We need help! We are in a humanitarian crisis!" It's a crisis that, as Cerrato noted, is taking place with very limited communication. As the Journal reported, Internet-usage tracker NetBlocks said just 12 percent of Venezuela's Internet network was connected as of Monday. Some Venezuelans are bracing for the worst. "This is going to end ugly. It's going to be ugly at the end," designer Nela Garcia told Reeves over the weekend. "My daughter that is now living here, she has a kid. And she's pregnant. ... She's always worried. Now we don't have light. We don't have water. So it's very hard to live here with all these, you know, situations."